This gathering was billed as The Last Hurrah because we thought it might be our final celebration before Marion/Mom and Gail move out of 8447. Although this proved premature, we pulled out the stops and came up with our first Talent Show. 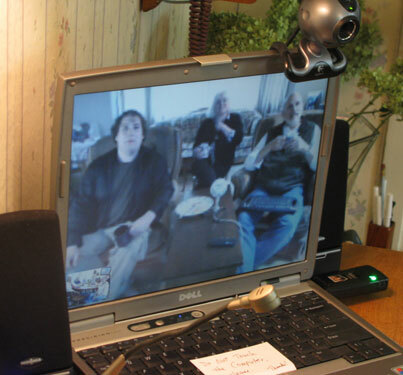 Thanks to the tech-savvy planning of Jude and James, we enjoyed the the first "intercoastal" Jabo get-together (hereabouts the Great Lakes have been called America's Third Coast) via computer. This went on all day, an hours-long video phone call. Chris recalled an experience of butterflies over 8447, and read a story she'd written some years ago. Jude MC'd and sang a number of songs, including "The Water is Wide" and The Black Velvet Band"
Bob read one of his entries from his blog "My Two Innings"
Day and Bill/Lou played a duet on Indian tamboura and Scottish smallpipes, and fielded many questions about the instruments, Here the tune "Going Home" is set to a mawkish video paean to 8447.